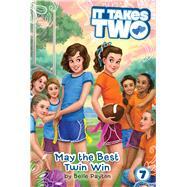 Ava and Alex are taking sibling rivalry to a whole new level in the seventh book of the It Takes Two series! It’s Homecoming Week in Ashland! That means a big game, a big dance, and, most importantly, Powder Puff. But when Alex and Ava are placed on different teams for the middle school girls’ flag football game, trouble brews. Ava is getting loads of extra attention because of her athletic ability, but this leaves Alex feeling majorly left out. Not one to hide from a little competition, Alex is determined to beat her sister at her own game by becoming her team’s secret weapon! But Ava isn’t worried about her jealous sister or Powder Puff. Because she has ADHD, she’s supposed to get extra time on her tests, but her new substitute science teacher is refusing to give it to her. Ava knows it isn’t fair—but how is she supposed to fix things in her science class and win Powder Puff for her team?